At Hatfield Subaru, we want to make sure that you are staying safe on roads when they are wet, snowy or icy. 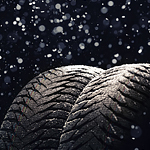 During the winter months, there are many different varieties of tires that you can use to gain better traction. Studded tires may be one option that you can choose from. However, modern tires tend to offer adequate traction without the need for the stud. In some cases, studded tires are illegal for use on local roads regardless of road conditions. Tires that do not have studs on them are designed to provide traction on both ice and snow. Of course, the car may lose some traction in icy conditions as there is nothing to tear through the frozen water with. Finally, you may choose to use performance tires that have no studs but are designed to create more traction on snowy and dry roads.